Speaking to Ann Avery at Northrop and Johnson, I discover that her central agency listing, the 29.26m sailing yacht Azzura has had a fairly hefty price cut. 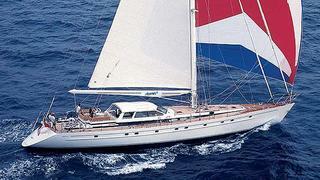 Azzura was built in 1998 by the renowned Dutch yacht-builders, Jongert. Together with her tall cutter rig, slim-line freeboard and low-profile deckhouse, she offers outstanding performance combined with luxury and comfort throughout. Refitted in 2007, this superyacht sleeps six guests in a master and two twin cabins. Azzura is in virtually new condition after her refit and is now asking €4.495 million, less than half her replacement cost.